Photo credit: DFID – UK. CC-BY-NC-ND. They are defiant of all the tumult and turmoil around, defiant of the changing and changed times and know that music is the source of all arts; and that music loses its meaning and soulfulness the moment it is contaminated with visuals. Its essence lies in its being heard and felt rather than seen. How could one see music? This is simply a non-existent category. They know that music, when it rides on the airwaves, meets sunshine and clouds on the way, wafts in air, crackles, and trails off before regaining a measure of lucidity, is the ultimate romance as it leaves much to imagination and longings. Clearly they have not turned their backs on the old ways of doing things, despite the seductive pull and meretricious glitter of the new ways. It is not that they are bereft of those big and small television screens and other electronic gadgets; it is that they have everything and still seek solace in the warmth of Radio. 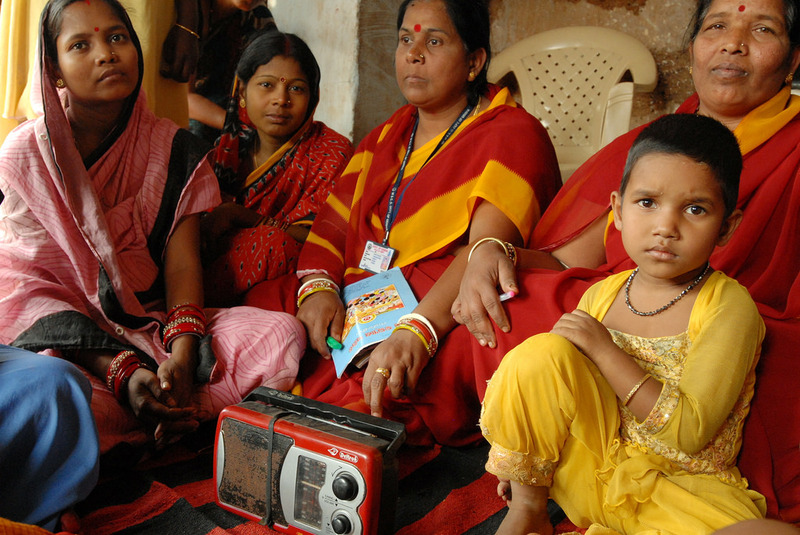 They are men and women of community who still place Radio at the centre and surround it to imbibe those mellifluous lines that come out magically as salve to their bruises, to provide a patina of pertinence to their humdrum existence. When the anchor announces the names of their mohallas and qasbas, they feel elevated; when their names are announced, they find themselves on cloud nine; when the song they requested for starts playing, they feel absolutely mollycoddled. To them, it signifies that someone somewhere feels for them. They start singing in unison. Most of them sing badly as they are unable to sustain themselves or they go hoarse after a reasonably promising start. Or else they fail to anticipate the flow of words and err using pyaar for mohabbat or else they develop a nasal twang. They carry on nonetheless. They are happy to remain caught in the warp and weft of the time. Credulous and gullible, they would still trust their instincts to trust the strangeness of outsiders. They still have time to track the flight of a fly or the nervous energy of a squirrel. The way a squirrel takes an animated start, stops abruptly, jumps to the left, flounders to the right, jerks ahead, picks up some wind-swept seeds, dislikes, and scatters them, takes a pause and feels complacent for a moment. They know that music is the quintessence of our lives and informs all our eccentricities. They are strangely smug people – unaffected by the screaming headlines of newspapers or by the blaring television sets that sometimes pronounce the ‘End of History’ and some other times predict the imminent ‘Clash of Civilisations’. They are essentially genteel people, who remain consistent through all the inconsistencies of life. Too rooted in the present with community as the permanent backdrop, they are either blithely or cynically indifferent to the turmoil of the future. All it takes is just a song along with their names and location to fill their lives with life-affirming meanings. When you are utterly exploded, when mundane obsessions of uncharitable times take a toll, when nerves are taut and when you feel that life is not a playfield but a battlefield, running into these people would remind you that life is a playfield and it would always remain so. So these people are the software that keeps India moving, despite the cassandras of doom predicting the final catastrophe every now and then. They still believe that words spoken cement a community together; words written are sacrosanct; songs sung are our deep-seated stirrings; community is where life is. Their life could be harsh and humdrum but every so often, they meander and lose their way in music and songs. Those community songs of life and death, celebration and separation, hope and anguish, religion and profanity are embedded in their genes. Thus it is around the paan-shops of Jhumri Tilaiya or in the seedy dhabas of Majnu ka tila or in the mango orchards of Digha that someone, while listening to those heartfelt songs, is secure in the belief that governments come and go but India would survive because people still send requests for songs to be aired. On a hot summer long ago, when I had torments of guilt about my adolescence, I heard my name being announced on Radio for the first time. It was soon followed by ‘Hato kaahe ko jhuthi naa banao batiyaa’ and I felt pure, explicit, and invulnerable. When I told about it to my teacher the next day in the school, he gave me a tight slap. But that is another story.